RMC Prayer Summit Held at Glacier View Ranch » Prayer Summit at Glacier View Ranch can be summed up in three words: God is AMAZING! Some 70 people worshiped, prayed, and learned more of what it means to deepen our walk with Jesus personally and how to create more space for God to work in united prayer. With Ed Barnett, RMC president, we looked at times of intercessory prayer in the Bible and reminded each other that God still works today! 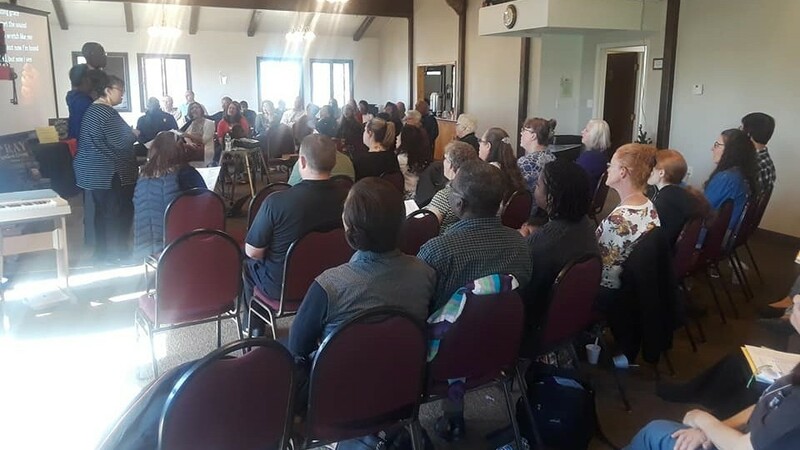 Prayer ministry team member Dale McCluskey led us in a time of seeking God’s face rather than seeking His hand, and Paulet Howard, presenter of prayer summit weekends, together with James Black, showed us a model for including our communities in prayer events. Saturday night we focused on what Jesus accomplished for us, and the whole weekend allowed us to make connections with Jesus and each other to strengthen our walk with Him. Couldn’t make it this year? Plan for the next time, and until then, gather some friends, and – LET’S PRAY! 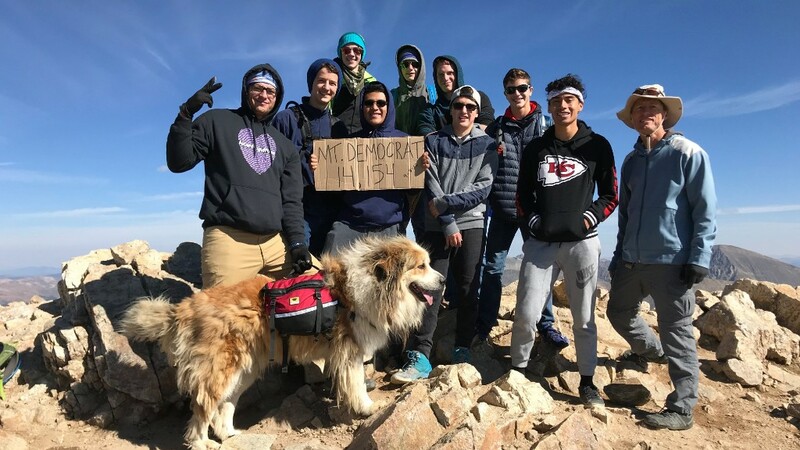 Campion's Students Conquer Three 14ers » Campion’s Outdoor Club spent the weekend of September 9 and 10 camping above tree-line encircled by three of Colorado’s famous “fourteeners”, mountain peaks that rise above 14,000 feet. They were rewarded for braving a cold night in tents at a high elevation with glorious hiking weather and the opportunity to summit all three peaks in a full-day’s hike. Mile High Academy Lower School Initiates Student-Led Worships » CHERISH worships are taking on a whole new look for MHA's lower school students with worships being led by the students themselves. 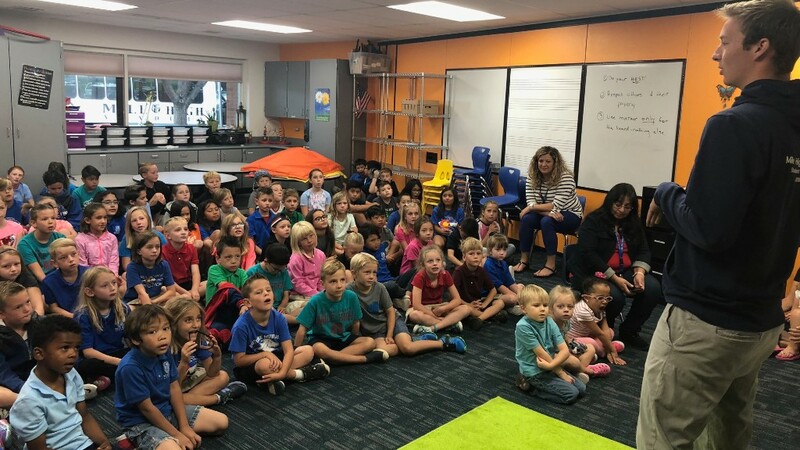 During the summer, Kindergarten teacher, Ms. Kate Kamarad, spent time in prayer over the weekly Lower School (LS) CHERISH worships that bring the youngest students together at the end of each week. She took the plan that grew out of those prayer sessions to the other LS teachers who responded enthusiastically. "These student-led, service-oriented meets are just what our little ones need to feel encouraged and inspired," remarked Kamarad. The first few weeks were led by Upper and Middle School students to give the younger ones a guide to follow. During one of those weeks, Michael Brodis, a senior at MHA, shared his story and showed the LS students how to stand up in front and speak to a group. Recently, first graders led out in singing and prayer and three of our Middle School students presented worship. "It's wonderful to see our youth take the stage with their stories and leadership," Kamarad enthused. "The confidence students show when they get up front lets other students know they can do it, too." Soon, LS students will be leading service projects, small group discussions, skits, and stories. After the Middle School worship, Kindergarten student, Emma, whispered to Ms. Kate, "Maybe next time we can be up there talking about Jesus?!" Exactly, Emma, that's exactly what we want you to do. Mental Health Certification » Learn to recognize the people around you who are experiencing hopelessness with thoughts of suicide and get certified in the process. This two-day, 8-hour certification class will be held September 8 and 15 from 2 to 6 p.m. in the Aurora Church sanctuary and will give you a 3-year certificate allowing you to work as a mental health first-aid responder for anyone having a mental health crisis. Taught by Lucille Campbell who holds a Master's in Public Health and is the former director of The Center of African-American Health, the class fee is $20, which includes teaching materials. Passing the test at the end of the seminar gives you the certificate. 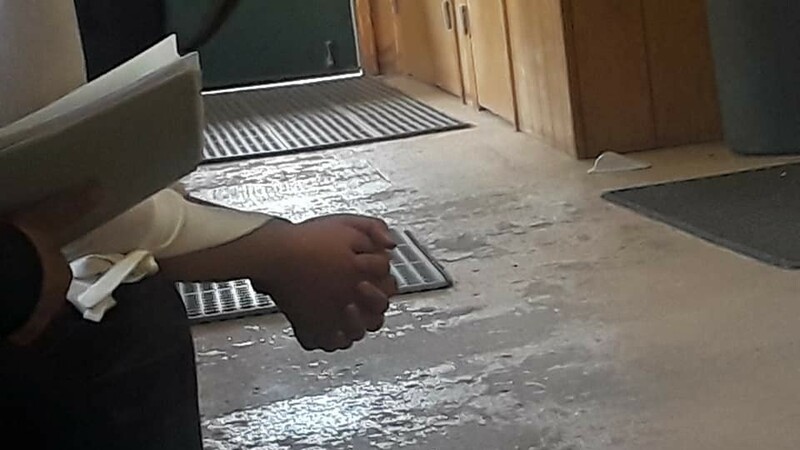 Write your check to the Aurora 1st Seventh-day Adventist Church and mail it no later than September 5 to Aurora 1st Seventh-day Adventist Church, 11400 E Mississippi Avenue, Auirora CO 80012.For further information, contact Health & Disabilities leader Yvonne Johnson at 303-905-6071. Diabetes UNDONE » By 2020, 1 in 2 people will have diabetes or pre-diabetes. Save the dates of Sunday, September 9 (8:30 a.m. to noon); and Monday evenings September 9- October 8 (5:45 p.m. - 8:30 p.m.) for a diabetes prevention and reversal program presented at the Twin Peaks Adventist Church at 9696 Paschal Drive, Louisville CO 80027. The $149 registration fee includes media presentations by Dr. Wes Youngberg, author of Goodbye Diabetes and dietician Brenda Davis, author of Defeating Diabetes, a Plant to Plate cookbook, workbook and handouts, online extended education, glucometer and hemoglobin A1C test, plant-based food recipes and sampling, and 8 Laws to a Better, Longer Life DVD. Registration closes August 31. Program size is limited to 10 people plus their spouses. Contact Rosemary Cook at 303-465-4010 for more information and to reserve your spot for a new lease on life. Korean-American Church » The Korean-American Church Council will meet at the Aurora Doubletree Hotel September 9-15 for the 13th General Meeting of Korean-American churches in North America. Ed Barnett, RMC president, and other leaders will join some 200 Korean Church pastors and leaders in participating as presenters. Franktown Church » Mike Tucker, from Faith for Today television, will host a FREE live Seminar, “MAD ABOUT MARRIAGE”. Learn how to maximize your connection, create safety in your relationship, and avoid the negative issues that threaten marriage. Explore ways to stay “Madly in Love” forever! Seminar will take place at the Franktown Seventh-day Adventist Church, 905 N. Hwy 83, Franktown CO 80116. Register at www.madaboutmarriage.com Pre-registration reserves your materials. For more information, call or email w[email protected], 303-688-8687. Childcare available only by reservation, email local host with children’s names & ages. Western Slope Women's Retreat » A women's retreat will be held on the Western Slope September 14 - 16 at Mountain Top Retreat, 339 Bible Camp Rd., Montrose, CO. It is just 15 miles south of Montrose, adjacent to the Uncompahgre National Forest. Guest speaker, Jeanie Ryan, will speak under the theme, “Bear One Another’s Burdens”. Features include music, a Scripture walk, hayride, and other fun Sabbath evening activities. Please plan on spending a relaxing and spiritual weekend in the mountains. For questions and registration, call Judy Kelley at 970-249-7237 as soon as possible. Pathfinder/Adventurer Convention » To register for the Pathfinder/Adventurer Leadership Convention, coming September 14-16, go to wwwrmcap.org. The Appearing » Churches across North America will present a new series from the Voice of Prophecy called The Appearing October 11-15. Hosted by Pastor Shawn Boonstra and local pastors, this five-part event follows in the footsteps of the award-winning Shadow Empire and A Pale Horse Rides series and will only be available in local churches. It will combine cutting-edge media with Bible clarity to reveal what Scripture actually says about the Second Coming. An all-new book and Bible studies will also be available. Visit appearing.org to find a location near you and watch for many more to be added in the coming weeks. 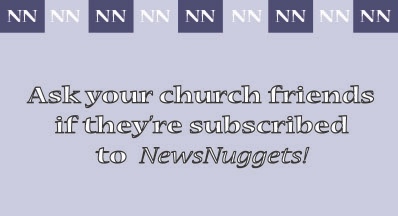 Don’t see your church on the list? Encourage them to sign up at www.appearing.org/host. Discover Israel: A Journey of Faith » See Jaffa, Caesarea, Nazareth, Cana, Tiberias, the Sea of Galilee and many other biblical locations on this journey of faith March 11-19, 2019. You can travel with Pastor Gordon from the Arvada Church on this amazing adventure. Sign up by September 12 by following this link: https://gateway.gocollette.com/link/871840.